In A (Rare, And Always Risky) LIVE Radio Interview! Perhaps unwisely, famed radio interviewer Pam Stack will talk with Earl about his books (and, she says, his "career"— whatever that means) on June 15. Tune in, unless the FCC gets wind of this... and closes us down, summarily. Where to start with THE LAW OF UNINTENDED CONSEQUENCES, by author Earl Merkel? How about entertainment? This book is a thoroughly enjoyable experience. It’s one of those books that I will place ‘on the shelf’ in a prized place because I know that I will be reaching for it again sometime, especially now that I know that the second book in the series will be coming out in the fall. No spoilers here, but I will say that ‘Faulk Carpenter’ is a very engaging protagonist, because Mr. Merkel somehow writes him in a way that makes even a person most remotely removed from ‘Faulk’s’ lifestyle sit back and say, “I know this man,” and that kind of writing and character, plus a very well-crafted plot and subtexts held me from the very start. There is also the element of expertise that Mr. Merkel brings to the table as someone who has experienced the sea and sailing firsthand, for many years. You can’t bluff your way through that. Though the story doesn’t revolve around seamanship per se, he still writes that aspect inclusively, so that someone like me, whose seamanship amounts to riding ferries, can feel the spray on my face, and that’s good, because there’s plenty of grit in this tale that needs to be washed off, and a balance of humor that helped to round the whole experience out. If you like mysteries and thrillers, and you want to find a new character and series in the genre that you will be pleased with, I highly recommend reading this novel! Fallout is another great Beck Casey story that pivots in various directions, until multiple strings meet and intertwine for an explosive conclusion. Followers of the series would expect nothing less. The story melds many political threads, foes and allies. The reader will get a close look at the threats and motivations of the characters as the plot pushes forward. Never a dull moment, from assassinations, buildings blown up, to computer viral threats. Even though a genre spy story, there are some unique characters in this book, using friends to fill in the ranks needed to pull off this complex story; like mine, a bomb tech, shows up in chapter 63! The plot uses all forces, from CIA, FBI, Mossad, MI6 and more! Definitely an insane political ride with surprises at every step. A great political thriller for the serious reader. For any who've not yet heard, I'm being interviewed on "Creating Calm" radio this morning (Thursday, Aug. 29), with the lovely & talent Ginger Dawn wrestling the microphone from my grasping hands to ask some insightful --and, yes: occasionally risqué-- questions. Book Reviews! We LOVE Book Reviews!! 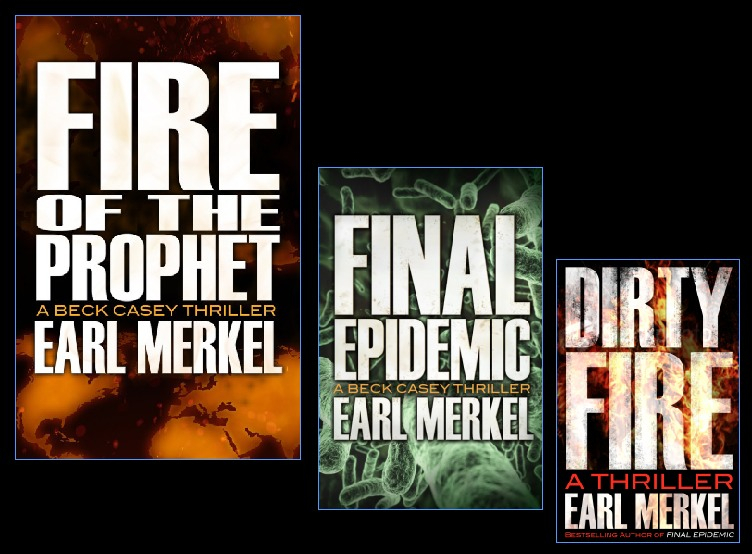 If you're at loose ends waiting for Showtime's HOMELAND to return next fall, FIRE OF THE PROPHET by Earl Merkel is your salvation. It's better. From chill-inducing scenes set in some of the most dangerous locales in the world, to the gripping narrative of the race to head off a nuclear terrorist attack in the nation’s capital, to thrilling and realistic deadline pressures inside television newsrooms and editing suites— FIRE OF THE PROPHET has it all, populated with characters drawn so real-life that you can almost see them sweat. Earl Merkel has it all in here. You won’t find a better 'summer read' than this book. Hand Of Fate, Heart Of Ice, and legal analyst for Fox News. Anybody who's holding back on buying Earl Merkel's new thriller, is nuts. It's great! 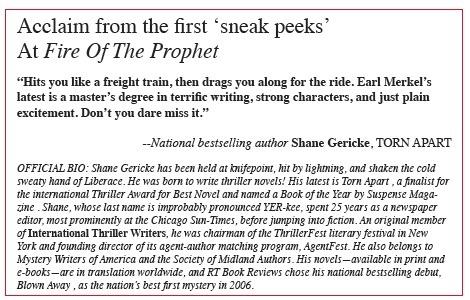 "Fire Of The Prophet" is a first class thriller. In a world cluttered with terrorism-fiction, this one stays a novel first and a plausible political-military read second. The people are real, the strains on relationships believable. The writing is succinct --and author Earl Merkel seldom succumbs to the rapture of his own words, (** SPOILER ALERT! **) even when describing the incineration and radiation poisoning of the East Coast. It's the best example of this suspense genre since Nevil Shute carried this off in his classic novel "On The Beach," leaving to the reader the task of filling in the mass horror between individual reactions to the bomb. Merkel's protagonist, Beck Casey, first appeared in his"Final Epidemic," which focused on a biological-based terrorism attack. In "Fire Of The Prophet," Casey seems gently to be making room for a son-in-law partner in the next book. That's good news, since both of them are credible types. This book is a consuming read, with passages that have the hallmark of editorial care and a writing mastery that have honed each word into precision instruments to carry the story. None of this is to imply that "Fire Of The Prophet" counts on literary style along. For instance, the techinical aspects are either true, or so detailed and confidently presented as to connote truth. This helps Merkel avoid a common pitfall for most writers of this genre: the readers who are mini-critics of the "wrong weapon" or the glossing over of scientific sections will have nothing to complain about in "Fire Of The Prophet." Even better, readers who enjoy spine-tingling suspense in a richly character-driven, keep-you-up-reading-all-night, "can't-wait-for-more!" thriller can celebrate opening the covers of this novel. International thrillers populate the shelves but on occasion one jumps off the page the moment you begin reading, and FIRE OF THE PROPHET is one such title. The sequel to Final Epidemic, this novel stands on its own two feet with whip-smart dialogue and non-stop action as well as extremely well drawn characters, both the good guys and the bad, the truly BAD. The novel's pace is breathtakingly fast, and it is more visual than a Bond film and the stakes are as high if not higher. The suspense woven into the storyline is no less than watching a master at work. Each page crackles with all five of your senses on the front burner and that sixth sense then smacks you in the face. This is a powerful behind the scenes look at how terrorism and international intrigue works. 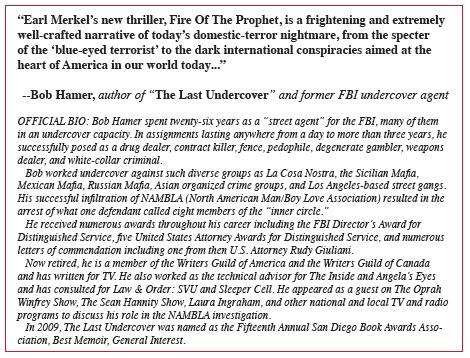 Earl Merkel knows his stuff and never leaves you guessing about the details of inner workings in the dark agencies on both sides of the war on terror. It is timely and gripping. 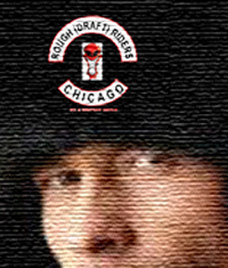 The author takes you by the hand and drags you kicking and screaming through a world of violence filled with the agents of evil and the agents of good. Review by broadcaster Pam Stack, host of "Authors On The Air." "Good morning! Have I got a book for you to read. I just finished Earl Merkel's "Fire of the Prophet" last night. "It's absolutely riveting. I read "Fire of the Prophet" in a single sitting: I couldn't put it down. It's too good." Pow! The opening chapter of Fire Of The Prophet is a shocker, and you are immediately swept into a scenario that keeps the reader wanting to know more. Vivid scenes, like in an action film, take you into the story that is relevant to current topics of today. Earl Merkel brings the reader close to the action, of what could be real life situations, and your worst nightmare come true! He uses his words to paint realism into the story, a candid and raw picture, entirely human. The characters are developed with great insights into the daily life and business of journalism, politics and the military. Tense, suspenseful, nerving, and nail biting action, fill the pages. The author uses powerful words, and visual symmetry, while keeping the story timeline organized and easy to follow along, with multiple viewpoints and plots that are all part of the bigger picture. The flow from place to place, person to person, is done well. Merkel brings unique flavor when he writes about the military side of the equation. A clear picture of the trauma and urgency, the men and women in active duty must endure every day, brought a new appreciation for our brave soldiers. Touching scenes of families reaching out to each other are emotional and heartfelt. I highly recommend this book for anyone who likes action, spy plots and a good look at the humanity (or lack of by terrorists) behind the scenes. FIVE STARS FOR "FIRE OF THE PROPHET"
One of our three listeners of "The Book, With Earl Merkel" plaintively inquires: "While I enjoy your 'Classic Conversations' interviews, when will you start running NEW interviews on your program?" A fair question. We DID run a live, call-in interview chapter-segment a week or so back --publisher Mary Cummings is STILL fielding e-mail book queries from youse guys as a result-- and certainly plan to do current-book author-interviews as we dodge FCC cease-and-desist orders. There are two problems: first, I want authors to be able to "strut their own stuff" WITHOUT the intrusion of a "host" --me-- shaping (or mis-shaping) what they want to say on-air. Hence, my invitation for writers to submit their own recorded "audio essays" for Da Show. But second, the biggest problem here is one of my own making: for the past decade of my broadcasting "career," I've insisted that NO interview occurs without me actually READING the author's book first. (sigh) I've been on the other side of the mic, agape at an interviewer who obviously had no idea of what I had written (or, usually, even who I was)... and IMHO, that's embarrassing to both parties (and a fraud on the audience, too). So I won't do it on "The Book, With Earl Merkel." No way, dammit!! As my own new-book deadline looms, my time to read others' works is currently a tad limited. But with reading a personal passion --and with a wealth of great authors out there to interview-- rest assured that I'll be reading your books and booking your appearances. But please-- don't let that stop you from writing & submitting stand-alone "audio essays" on whatever floats YOUR boat. IMHO, that's where a writer can REALLY show her-or-his writing chops... and that's what "The Book, With Earl Merkel" wants to be about. And if you have a fellow writer who might benefit from a li'l on-air airing of his/her talent, encourage 'em to do likewise. We eagerly await your calls & letters. Unless you, in fact, DO work for a broadcast-regulatory agency. My latest thriller, Fire Of The Prophet, is now available on Apple's iBookstore and Amazon.com. For a description (and to order it, of course) click here. Barnes & Noble has named my Fire Of The Prophet as its "Nook First" featured selection! Visit http://www.barnesandnoble.com/w/fire-of-the-prophet-earl-merkel/1115375361?ean=2940016470696 for special deals and promotions, and to order Fire Of The Prophet online and in B&N stores. Our long national nightmare is over: I can stop changing my Facebook "cover photo" every freakin' countdown-day. On sale now: Fire Of The Prophet. *** My latest thriller, Fire Of The Prophet, is now available on Amazon.com, for immediate delivery to your Kindle: click http://www.amazon.com/Fire-Prophet-Casey-Thriller-ebook/dp/B00CWCW7AK/ref=sr_1_3?ie=UTF8&qid=1369129722&sr=8-3&keywords=fire+of+the+prophet+earl+merkel to order it today. Fire Of The Prophet is also available in print format from Amazon. For iPad and other MOBI devices, Fire Of The Prophet is available from Apple’s iBookstore. For a description (and to order it, of course) click https://itunes.apple.com/us/book/fire-of-the-prophet/id639618193?ls=1. Barnes & Noble has named Fire Of The Prophet as its “Nook First” featured selection for the month starting May 25! Visit http://www.barnesandnoble.com/w/fire-of-the-prophet-earl-merkel/1115375361?ean=2940016470696 for special deals and promotions, and to order Fire Of The Prophet online and in B&N stores. "Looks like triplets"? What the hell do you mean, doc??? Next time, advance sonograms. Definitely, much more attention to prenatal visits! "Information I could have used earlier" -sonogram in accompanying illustration, below. Yes. Three on one day! --delivered by those fine folks at Diversion Books (New York). My latest thriller, Fire Of The Prophet, is now available on Apple's iBookstore for pre-order (in advance of the May 21, 2013 pub-date). For a description (and to order it, of course) click here. Barnes & Noble has named my Fire Of The Prophet as its "Nook First" featured selection for the month starting May 25! Visit http://www.barnesandnoble.com for special deals and promotions, and to order Fire Of The Prophet online and in B&N stores. Nope, I'm pretty sure this is the Real Thing. As the accompanying illustration notes, we're right on top of the Due Date. "Dear Emily Post: I Have A Question..."
A very nice --if blush-inducing-- way to wake up: thank you, Elisabeth Zguta! For (I hasten to add, with another double entendre blush at the wording above) her very kind review of my to-be-released-on-Tuesday FIRE OF THE PROPHET on Goodreads.com. Ms. Elisabeth, you are officially my "first" (review of this book; <sigh!> insert another blush *here*), and I appreciate it, greatly. "Dear Emily-- would it be a bridge too far if I read Ms. Zguta's review on my upcoming radio show, which debuts June 2 on Authors On The Air Global Radio Network? Okay, how 'bout if I limit myself to only a half-dozen or so 'reads' of it on-air? I mean, I don't want to overdo this. --Yrs. Truly, 'Perplexed Author." It's early --most likely, 'way too early-- but here's where you can read the teaser for my new radio show: "The Book, With Earl Merkel," debuting at 9 p.m. Eastern on Sunday, June 2, via the Authors On The Air Global Radio Network. BTW, I'll be featuring "guest essays" written by --and read by-- writers and authors. On any topic they choose. Here’s how bad it’s gotten in Prime Time radio: I’m interviewed on-air tonight at 7 p.m. EDT (please figure out your time zone yourself; all I know for certain it’s 6 p.m. Central and in daylight-saving-averse Arizona) by the host of Authors On The Air, the lovely Pam Stack. We’re live –arguably… at least I’d say so; listener opinions may vary– and can be heard online at www.blogtalkradio.com/authorsontheair . More info at https://www.facebook.com/events/381697645272403/?ref=22 The show will be available on the Authors On The Air archive site, in the likely event that your Friday nights are far more active than mine. Here’s hoping the FCC take an early quitting time tonight. (POSTSCRIPT: Thanks to my publisher, Diversion Books, for doing this. All titles cited are available in e-book and ink-on-dead-trees "traditional" editions. C'mon-- you know you now have NO excuse, Faithful Readers! Google Search Keywords: DIRTY FIRE, Diversion Books, Earl Merkel, Final Epidemic, Fire Of The Prophet, iBookstore, PLEASE pre-order my books! NEWS FLASH: <chuckle> We are pleased: Diversion Books has delivered a striking, visually unified and "brand-theme'd" family of covers that now includes my new FIRE OF THE PROPHET. Review & "author's alts" of the "e-book" edition are completed, and the e-book is formatted; that should make my final review of the "ink-on-paper, 'physical' book" edition (promised for "author's alterations" this week) a relatively painless process. The pub-date --for FIRE OF THE PROPHET, its "prequel" FINAL EPIDEMIC, and the stand-alone DIRTY FIRE-- is currently set for May 21. (POSTSCRIPT: BTW, Pappy is fine, if not quite yet to the point of strutting... but the Muse-Mother is currently holding her swollen belly and moaning "ANOTHER month??? For the love of literature, NOT ANOTHER MONTH!!!" "We've set a tentative release date of May 21 for Fire Of The Prophet, but there's a good chance that we might want to move it up to an earlier date." Fire Of The Prophet will be published by Diversion Books (New York) sometime this year. We'll also see e-book editions of Final Epidemic and Dirty Fire. I couldn't be more delighted to sign with Diversion Books, or more grateful for the tireless energy & patience of my Long-Suffering Agent, Kimberley Cameron. Now... let's tell some stories, folks! The very nice part about a "starred - highly recommended" review in Library Journal magazine is that it sells a lot of books to libraries around the country. Sadly, Five Star —my publisher for Virgins And Martyrs— focuses its sales almost exclusively to libraries. At present, as a result Virgins remains... well, fairly virginal among the rest of the reading public. Bookstores offer it as a "special order." But only if a reader knows to ask for the book. Alas! I first met Publisher's Weekly columnist Barbara Vey at a mystery-thriller authors/readers conference where I was interviewing various participants for a radio show I hosted... and as a side-bonus, to provide my fellow authors with MP3 recordings of their segments as a marketing tool for their own websites. Barb stopped by to watch— and when she introduced herself, there was no way she was going to get out of my impromptu "studio" without a good, on-air grilling of the life-and-times of a PW columnist. Several months later —without prompting, I hasten to assure you— she wrote the following laudatory review of Virgins And Martyrs.